Driver Side is typically used on the driver side and does Not include provisions for the license plate light. The JK LED Taillight Harness - Passenger Side is typically used on the passenger side, and includes a 6-foot lead and weatherproof connector for our LED License Plate and 3rd Brake Light - PSC Connectors. You will need two of these JK LED Taillight Harnesses, typically one of each type, for Most configurations. Each of these Taillight Harnesses plug right into your Jeep factory wiring harnesssimply unplug the Stock taillight pigtail and plug the Poison Spyder taillight harness in its place. OEM quality connectors provide a positive, weather-tight connection just like the factory wiring. Weatherproof connectors are used for all other connections as well as automotive quality wires and split-loom protective sheathing. Once the Poison Spyder taillight harnesses are in place, several LED lighting products may be plugged directly into the harness or connected via jumper harnesses. 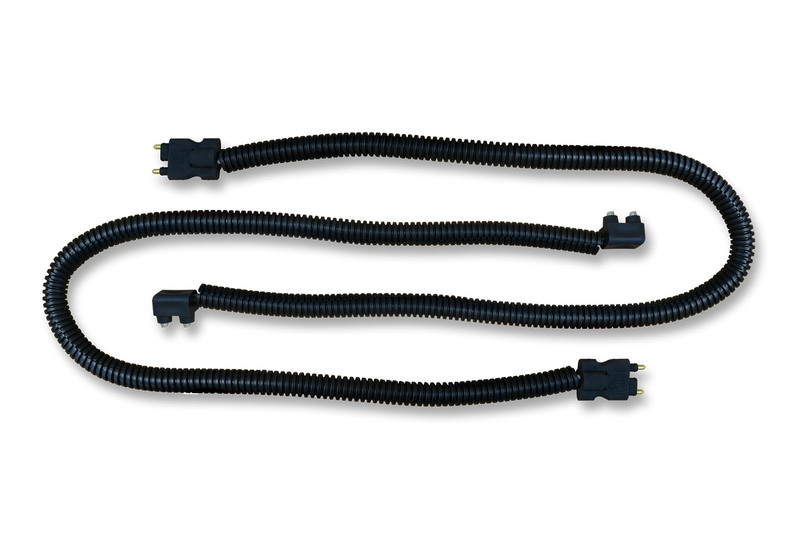 To connect to Back-Up Lamps located in the recessed mounts on many Poison Spyder JK Rear Bumpers, use the 24 Inch Back-Up Light Extension Harness on each side. Remember, there are two Back-Up Lamp connectors on each taillight harness, in order to accommodate both a 4 inch and a 24 Inch Back-Up Light Extension Harness on each side simultaneously. Both of these connectors are wired into the vehicle back-up lamp circuit. If you wish to divert one pair of these lamps to use as manually switched load or work lights, you'll have to research and make the necessary alterations to the harness and the vehicle wiring on your own. The passenger side Poison Spyder taillight harness includes a 6-foot lead with weather-tight connector to connect to our LED License Plate and 3rd Brake Light - PSC Connectors. On Most Jeep JKs on which Poison Spyder Crusher Corners and LED taillights have been installed, the license plate has been relocated from the Stock position on the driver side corner. In Most cases it has been relocated either to the spare tire carrier or to the center of the tailgate on those Jeeps where the spare tire has been removed altogether.